See my previous post for an overview of the topic. A very simplified geologic map is shown below. Basic information is superimposed on a Google Earth (2016) image of the dam area. The information is a combination of my own observations and those taken from a published geologic map (Dibblee, 1997) of the Warm Springs, California topographic quadrangle. This map is available through the Dibblee Geologic Foundation, which is easily accessed via the internet. The site of the St. Francis Dam was not a good place to build a dam, what with the San Francisquito Fault underneath the site. If you go to my previous post, you can clearly see a demarcation between the "white" lowermost part of the canyon and "gray" rest of the canyon. 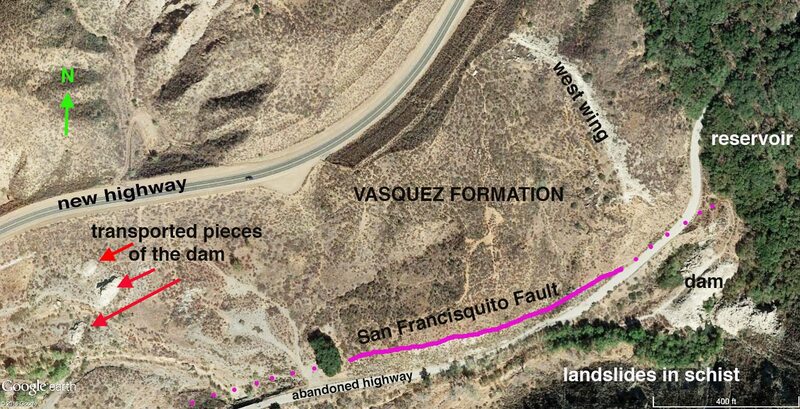 The "white" area is the Pelona Schist, and the line of demarcation is the San Francisquito Fault. Although considered to be an inactive fault, it uplifted the Mesozoic (or possibly older) Pelona Schist, which makes up the east side of the fault. The actual fault zone consists of sheared and fractured rock with plastic clay gouge about one foot thick and abundant gypsum crystals (reportedly, up to 11 inches in length). This fault had been mapped by professional geologists prior to the building of the dam, but that information was not utilized by the builders of the dam. The San Francisquito Fault has been commonly regarded as a strike-slip fault (horizontal movement), but, in recent years, the thinking has been more inclined to call it a strike-slip fault that has been renewed with a dip-slip component (up and down movement). Simplified geologic map of the dam-site area on a Google Earth (2016) image. This view is of the west side of the area immediately downstream from the dam site. The road is the abandoned highway, built many years after the dam collapse. Note the white rubble in the upper right-hand corner. This is what is left of the dynamited west wing. The abandoned highway is parallel and near the trace of the San Francisquito Fault. Most, but not all, of the rocks above this highway are the red rocks of the fluvial and poorly cemented Vasquez Formation (of Oligocene age = about 26 million years old), which were down dropped by the fault. Some of the rocks adjacent to the highway and all of the rocks below it are the uplifted Pelona Schist (of probable Mesozoic age). Many of the Pelona Schist outcrops have a superficial red color, which is derived from the overlying red rocks of the Vasquez Formation. 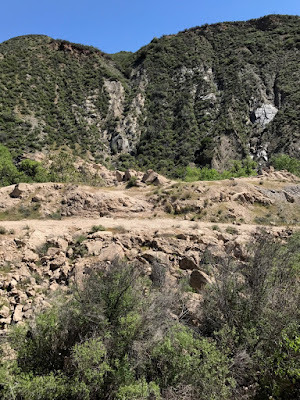 This picture is the view along the far left side of the previous photograph and shows the trace of the San Francisquito Fault along the west side of the dam site. The gray to yellow unstained Pelona Schist is left of the vertical to nearly vertical fault (i.e., the trace undulates). The beds of the sedimentary rocks of the red Vasquez Formation are to the right of the fault in this picture. The surface of this piece of Pelona Schist from the San Francisquito Fault zone shows slickensides, which are smooth/polished surfaces created by frictional movement along fault zones. This photo, which is up the road a small distance from the previous photo, is a typical outcrop of the red-colored Vasquez Formation after a rainstorm. As evidenced by the rock fall on the abandoned highway, when this formation gets wet, it is prone to falling apart. It is a poorly cemented ancient river-bed sandstone, which also contains veins of gypsum. Early geologists knew this, but the engineers who built the dam did not deem this information to be significant. They were hugely mistaken. The next three pictures prove my point. The three pictures above show the same orientation of a chunk of the Vasquez Formation sandstone. The first picture shows the chunk laying loose on the abandoned highway. Notice the white seam of gypsum crystals. I put this piece of rock in a bucket of water for two days. The next pictures show the results of my experiment. The middle picture is after only two days, and the last picture is after two weeks. As you can see, the rock mostly disintegrated via absorption of the water. This geological process is called "slaking." Just imagine how much hydrostatic pressure a rock like this would experience at the bottom of a dam after a short time. The next three pictures show the VERY close proximity of landslides along the east side of the dam. The view is to the east and shows the landslide scarps (their "heads" are just below a road) on the east side directly opposite the dam. These scarps are very steep and are underlaid by the Pelona Schist, which is this area has a very high angle of foliation (i.e., its component layers are steep enough to easily fail and cause landslides). The white rubble in the foreground is what is left of the concrete "wing" along the west side of the dam. The "wing" was demolished by workers after the dam failed. This is a side view of the landslide scarps, which are immediately east of the dam (now just a pile of rubble). Notice the series of stair-step-like surfaces of concrete just above the road on middle left side of the photograph. I showed a closeup of them in my previous post. The main reason I used this photograph is to show the steep slippage planes in the landslides areas (mentioned and shown above) of the Pelona Schist. These landslides are mostly ancient landslides (paleo-landslides), which are obvious to the trained eye but were not recognized as such by the builders of the dam. This last view shows the frontal view of the landslide scarps, with the remains of the dam in the foreground. At the Govenor's request, a commission investigated the failure of the dam. They found that it did not fail because of weak concrete. It failed because of many problems. Some of these are recognizable geologic problems and include: 1) The inevitable landslides associated with the poor quality rock and steep inclination of the foliated Pelona Schist along the east abutment of the dam; 2) the even worst quality rock of the crumbly, porous Vasquez Formation along the west abutment; and 3) the crumbly and weak nature of the actual fault zone itself. For those who want to see some really great vintage photographs of the dam immediately after its collapse, please Google the following phrase: slaking St. Francis dam disaster. You ought to check it out; it is worth the effort. By the way, you will also discover that there have been several books written about the failure of the dam. A few are still in print.